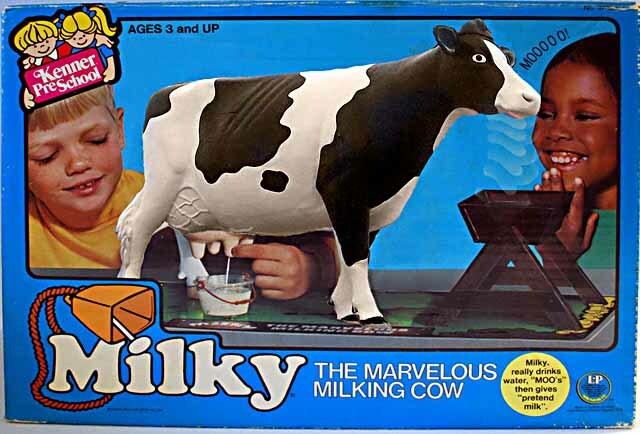 A nostalgia-themed Facebook page that I follow posted a picture of Milky the Marvelous Milking Cow by Kenner the other day, accompanied by this observation: "I think I had this..or maybe my cousins did. Regardless, it was kinda weird..and so was the white-ish watery probably toxic substance that Milky 'produced'." Then someone who follows the page chimed in with this comment: "That's crazy and kinda creepy....Glad my kids never wanted one :-P."
And on YouTube, someone who posted the commercial for this toy declared it the Worst Toy Ever Made. To all of these misguided folks, I have something to say to you: what the hell have you been smoking? Milky the Marvelous Milking Cow ROCKED. I'm almost personally offended that anyone could call this adorable toy creepy and weird. And as far as the pretend milk tasting bad--well, duh! It wasn't real milk and you weren't supposed to drink it. At the age of six, when I first got Milky, even I knew that. To give you the lowdown on Milky, this was how the toy worked: you unscrewed the udder and placed a chalky "milk" tablet in it. Then you filled Milky's trough with water. You'd press her head down so that her mouth was in the water, and then you'd pump the tail, which caused Milky to "drink" the water. When she'd had enough--about after a minute or so--her head would pop up and she would let out of a moo! Then you could milk her by squeezing one of her udders that had a tiny hole it in, and fill the accompanying milk pail. And yeah, that was it. But creepy? I'm not sure why people would find this toy creepy and gross--I thought it was cool. In fact, I still have Milky! Kids are still drawn to it--when my nieces and nephews were little, they played with Milky and one of my nieces has a four-year son who always wants to see the cow when he visits the house. Sadly, Milky's head no longer stays down and thus she no longer moos, but I will hold onto her for old time's sake. When I find my own place, Milky will probably take up a small kitschy spot of her own in the kitchen. Kenner made the coolest toys--in addition to Milky, I also owned an Alvin the Aardvark--he was an aardvack with a long velcro tongue that would "eat" the giant ants that came with the toy. Besides, this toy was nowhere near as disturbing as the Play-Doh Doctor Drill N Fill. Anyone else own or remember Milky? Aww poor Milky! I don't ever remember seeing it, but I agree with you - I don't find it creepy. And you're right, we new not to drink stuff like that even at an early age - I had a baby doll that you fed 'milk' - I knew it was fake and for the dolly and never even thought to drink it. I knew it was a toy. Why does Milky have such full pouty lips? These people who found it "creepy" must never have lived near a farm. My mother grew up on one, and they had cows. Nothing "creepy" about milking them...I can't imagine how a toy cow could freak someone out. I am so excited ! We just ordered our Very own Milky The Cow off of E-bay! If you could give us some insight on how to find or recreate the pretend milk tablets, that would make my day! I had this as a kid too. The deal with all the negative comments is just people 'trying' to be funny .. and sucking at it. They look at something, completely out of it's intended context, And mock it for what they personally see as faults in attempt to be "witty". The toy was a ton of fun and never got old. In the 70's when it came out there was a heavy influence in pop culture on rural life. Like Little House On The Prairie and The Waltons on TV. And the whole 'crafting' and 'getting back to nature' movements that happened then. 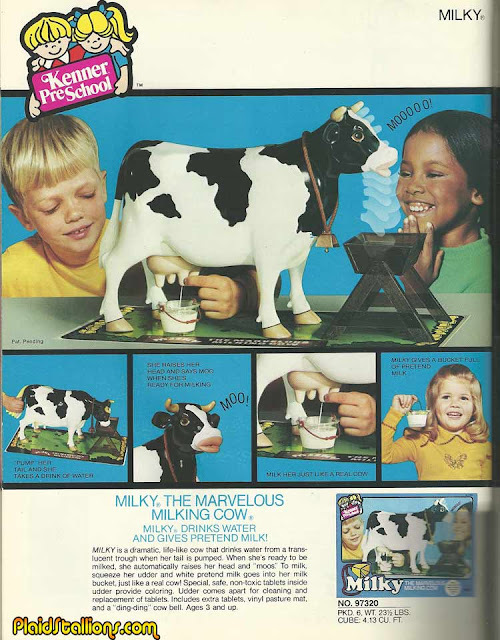 A toy that capitolized on that... that brought farm life to little kids in that way who may have only ever seen a cow on TV made a lot of sense from a marketing standpoint. Just because little kids nowadays would rather have tablets and cellphones doesn't mean that 'then' this cow wasn't a great little toy.